This article is about the civil engineer. For the baggage handler, see John Smeaton (born 1976). For the Australian cricket umpire, see John Smeaton (umpire). John Smeaton FRS (8 June 1724 – 28 October 1792) was an English civil engineer responsible for the design of bridges, canals, harbours and lighthouses. He was also a capable mechanical engineer and an eminent physicist. Smeaton was the first self-proclaimed "civil engineer", and is often regarded as the "father of civil engineering". He pioneered the use of hydraulic lime in concrete, using pebbles and powdered brick as aggregate. Smeaton was associated with the Lunar Society. Smeaton was born in Austhorpe, Leeds, England. After studying at Leeds Grammar School he joined his father's law firm, but left to become a mathematical instrument maker (working with Henry Hindley), developing, among other instruments, a pyrometer to study material expansion. In 1750, his premises were in the Great Turnstile in Holborn. He was elected a Fellow of the Royal Society in 1753, and in 1759 won the Copley Medal for his research into the mechanics of waterwheels and windmills. His 1759 paper "An Experimental Enquiry Concerning the Natural Powers of Water and Wind to Turn Mills and Other Machines Depending on Circular Motion" addressed the relationship between pressure and velocity for objects moving in air (Smeaton noted that the table doing so was actually contributed by "my friend Mr Rouse" "an ingenious gentleman of Harborough, Leicestershire" and calculated on the basis of Rouse's experiments), and his concepts were subsequently developed to devise the 'Smeaton Coefficient'. Smeaton's water wheel experiments were conducted on a small scale model with which he tested various configurations over a period of seven years. The resulting increasing efficiency in water power contributed to the Industrial Revolution. Over the period 1759–1782 he performed a series of further experiments and measurements on water wheels that led him to support and champion the vis viva theory of German Gottfried Leibniz, an early formulation of conservation of energy. This led him into conflict with members of the academic establishment who rejected Leibniz's theory, believing it inconsistent with Sir Isaac Newton's conservation of momentum. The Wright brothers determined with wind tunnels that the Smeaton coefficient value of 0.005 was incorrect and should have been 0.0033. In modern analysis, the lift coefficient is normalised by the dynamic pressure instead of the Smeaton coefficient. Smeaton is important in the history, rediscovery of, and development of modern cement, identifying the compositional requirements needed to obtain "hydraulicity" in lime; work which led ultimately to the invention of Portland cement. Portland cement led to the re-emergence of concrete as a modern building material, largely due to Smeaton's influence. Smeaton is considered to be the first expert witness to appear in an English court. Because of his expertise in engineering, he was called to testify in court for a case related to the silting-up of the harbour at Wells-next-the-Sea in Norfolk in 1782. He also acted as a consultant on the disastrous 63-year-long New Harbour at Rye, designed to combat the silting of the port of Winchelsea. The project is now known informally as "Smeaton's Harbour", but despite the name his involvement was limited and occurred more than 30 years after work on the harbour commenced. It closed in 1839. Employing his skills as a mechanical engineer, he devised a water engine for the Royal Botanic Gardens at Kew in 1761 and a watermill at Alston, Cumbria in 1767 (he is credited by some with inventing the cast-iron axle shaft for water wheels). In 1782 he built the Chimney Mill at Spital Tongues in Newcastle upon Tyne, the first 5-sailed smock mill in Britain. He also improved Thomas Newcomen's atmospheric engine, erecting one at Chacewater mine, Wheal Busy, in Cornwall in 1775. The pioneering constant of proportionality describing pressure varying as the square of the velocity when applied to objects moving in air was named Smeaton's coefficient in his honor. Based on his concepts and data, it was used by the Wright brothers in their pursuit of the first successful heavier-than-air aircraft. A Grammar school in Plymouth, called Devonport High School for Boys, named one of their houses after him, because of ''Smeaton's Tower'' lighthouse in Plymouth. ^ Knowles, Eleanor. "Engineer Biography: John Smeaton". Engineering Timelines. Retrieved 31 January 2017. ^ a b Mark Denny (2007). "Ingenium: Five Machines That Changed the World". p. 34. JHU Press. ^ Nick Gromicko & Kenton Shepard. "the History of Concrete". The International Association of Certified Home Inspectors (InterNACHI). Retrieved 8 January 2013. ^ Knowles, Eleanor. "Engineer Biography: John Smeaton, water wheels and mill works". Engineering Timelines. Retrieved 31 January 2017. ^ Smeaton, Mr J (1759). "An Experimental Enquiry concerning the Natural Powers of Water and Wind to Turn Mills, and Other Machines, Depending on a Circular Motion" (PDF). Philosophical Transactions of the Royal Society. 51: 100–174. doi:10.1098/rstl.1759.0019. Retrieved 30 January 2012. ^ "Centennial of flight: Smeaton's Coefficient". centennialofflight.net. Retrieved 31 May 2010. ^ Rosen, William (2012). The Most Powerful Idea in the World: A Story of Steam, Industry and Invention. University of Chicago Press. p. 127. ISBN 978-0226726342. ^ a b c "Smeaton's Coefficient". www.centennialofflight.net. ^ "Lift equation of the early 1900s". Wright.nasa.gov. 25 March 2010. Retrieved 31 May 2010. ^ Dodson, MG (2005). "An Historical and Applied Aerodynamic Study of the Wright Brothers' Wind Tunnel Test Program and Application to Successful Manned Flight". US Naval Academy Technical Report. USNA-334. Retrieved 17 March 2009. ^ "Eddystone Lighthouse, Smeaton Tower substructure". Engineering Timelines. Retrieved 31 January 2017. ^ "Eddystone Lighthouse, Smeaton Tower (relocated)". Engineering Timelines. Retrieved 31 January 2017. ^ "Biff Vernon: "Smeaton's viaduct"". Biffvernon.freeserve.co.uk. Archived from the original on 21 January 2010. Retrieved 31 May 2010. ^ "Geograph Photo". Geograph.org.uk. 10 March 2006. Retrieved 31 May 2010. ^ "The Greenwich Hospital Smelt Mill at Langley, Northumberland 1768–1780" by F. J. Monkhouse, Transactions of the Institution of Mining and Metallurgy vol. 49, 1940. It is a Scheduled Ancient Monument Archived 5 December 2014 at the Wayback Machine. ^ "Smeaton's Harbour - Rye Castle Museum". www.ryemuseum.co.uk. Retrieved 8 September 2018. ^ "Smeaton's Harbour – Rye's Own Magazine". ryesown.co.uk. Retrieved 8 September 2018. ^ a b Acott, C. (1999). "A brief history of diving and decompression illness". South Pacific Underwater Medicine Society Journal. 29 (2). ISSN 0813-1988. OCLC 16986801. Retrieved 17 March 2009. ^ "Westminster Abbey – Robert Stephenson". Retrieved 26 June 2015. ^ "Westminster Abbey – John Smeaton". Retrieved 26 June 2015. ^ "Civil Honour". The Times. 7 November 1994. p. 16. ISSN 0140-0460. Wikimedia Commons has media related to John Smeaton. Haran, Brady. "The Lighthouse Designer" (video). YouTube. Brady Haran. Retrieved 20 February 2018. John Rennie FRSE FRS was a Scottish civil engineer who designed many bridges, canals and docks. Robert Stevenson, FRSE, FGS, FRAS, FSA Scot, MWS was a Scottish civil engineer and famed designer and builder of lighthouses. Austhorpe is a civil parish and residential suburb of east Leeds, West Yorkshire, England. It is 5 miles (8.0 km) to the east of city centre and close to the A643 dual carriageway and M1 motorway. William Jessop was an English civil engineer, best known for his work on canals, harbours and early railways in the late 18th and early 19th centuries. Smeaton's Tower is a memorial to celebrated civil engineer John Smeaton, designer of the third and most notable Eddystone Lighthouse. A major step forward in lighthouse design, Smeaton's structure was in use from 1759 to 1877, until erosion of the ledge it was built upon forced new construction. The tower was largely dismantled and rebuilt on Plymouth Hoe in Plymouth, Devon, where it stands today. James Walker FRSE, FRS was an influential Scottish civil engineer. 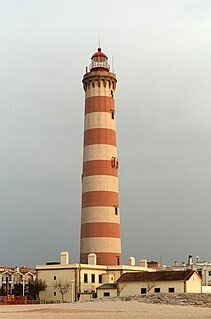 The history of lighthouses refers to the development of the use of towers, buildings, or other types of structure, as an aid to navigation for maritime pilots at sea or on inland waterways. George Sorocold was an engineer in Derby, England, in the eighteenth century. Millbay, also known as Millbay Docks, is an area of dockland in Plymouth, Devon, England. It lies south of Union Street, between West Hoe in the east and Stonehouse in the west. The area is currently subject to a public-private regeneration creating new homes, business premises, marina, a 1000-pupil school and opening up the waterfront to greater public access. Sir James Nicholas Douglass, FRS,, was an English civil engineer, a prolific lighthouse builder and designer, most famous for the design and construction of the fourth Eddystone Lighthouse, for which he was knighted. John Smeaton Academy is an academy and Sixth Form in Leeds, West Yorkshire, England. Donaghadee Lighthouse is a lighthouse in Donaghadee County Down, Northern Ireland. Donaghadee is probably best known for its lighthouse and harbour. There has been a haven for ships at Donaghadee for centuries, and there has also existed a harbour since at least the 17th century. William Tregarthen Douglass (1857–1913) was an engineer, from a lighthouse engineering family. He was a consulting engineer for lighthouse construction for several governments around the world. His father was Sir James Nicholas Douglass, and his uncle William and his grandfather Nicholas were also famous in lighthouse construction.